Kendall Jenner breaks Kim and Kanye's record for most liked picture on Instagram. Step aside, Kim Kardashian and Kanye West. Kendall Jenner is the captain now (of Instagram, that is). The popular couple are no strangers to gaining a ridiculous amount of double clicks on practically anything they post on Instagram, and Kim's younger sister isn't too far off, either. But, the time has come where Kendall has surpassed her famous family members—she broke Kimye's record. 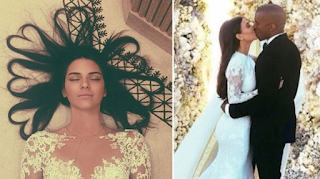 Last year, we reported that Kim and Kanye's gorgeous wedding photo where theykiss as husband and wife became the most-liked photo on Instagram with nearly 2 million likes, and now it turns out that one of the supermodel's social media pics has gained more attention and thus become the new record on Instagram. Yes, there are definitely lots of options and potential contenders but it was actually the photo of Kendall lying down in a gorgeous white and sheer gown with her brunette tresses spread out around her face forming little hearts. It was a close race, though. 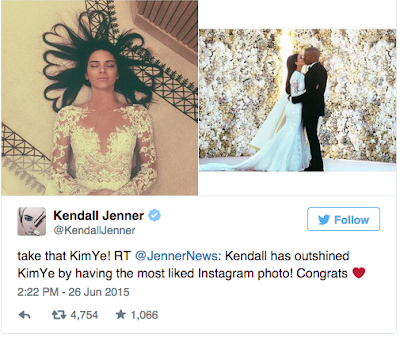 Kimye's photo is currently at around 2.47 million and counting, while Kendall's squeezed by with 2.48 double taps. Nothing like a nice,close social media competition. After hearing the news of her triumph, the 19-year-old had to take a quick second to taunt her older sis and brother-in-law, because, duh. She went to Twitter to retweet the news that included the two record-breaking pictures and adding a "Take that KimYe!"